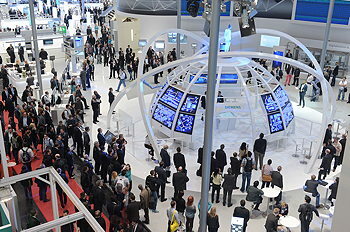 In 2013, the Hannover Fair marked the public debut of a concept called Industry 4.0. At the time, this probably meant very little to most of the 225,000 people who visited the show. Two years later, and you cannot escape Industry 4.0 and its implications. This year’s Fair placed a major emphasis on the digitisation of manufacturing and the vision of the “intelligent” factory, where information is exchanged seamlessly between machines and products. Another theme at the 2015 Fair was the arrival of growing numbers of robots designed to work safely alongside human colleagues on production lines. “Robots have been uncaged and can now directly support production crews,” said Köckler. This year’s show attracted around 220,000 visitors, 70,000 of them from outside Germany – setting a new record. There were around 6,500 exhibitors from 70 countries, some 350 of them from the 2015 “partner country”, India. In this report, we look at some of the technologies and products that they could see at Hannover. New from ABB is an extended range of rib-cooled, high-voltage motors, with a new frame size and the option of IP66 protection – unusual for HV motors. The NXR motors (below), launched in 2014, now span frame sizes 355–450 and the power range 100kW–1.25MW. The motors, based on the earlier HXR range, have been redesigned with the size, shape and location of the cooling ribs optimised, and a new coil design helping to boost power density. More features and extensions are promised for “the near future”. ABB has also extended its range of low-voltage IEC mining motors by offering Ex d flameproof protection for Group 1 applications. 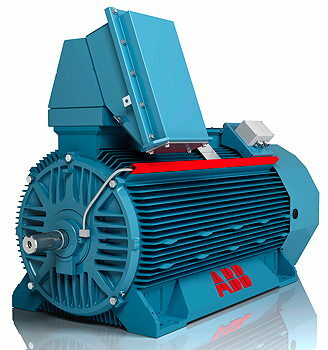 The VSD-compatible cast-iron motors, cover frame sizes 80–450, power ratings from 0.55–710kW, and are available with two to eight pole pairs (with higher pole combinations and two-speed versions available on request). Options include Class H insulation and a heater to avoid condensation. Baumüller has enhanced its b maXX family of inverters with new functions, including enhanced encoder evaluation that samples encoder signals at a high frequency, helping to filter out malfunctions and improve control quality. Preloaded or dynamic axes – such as those in robotic arms or servo presses – can be stopped safely in the event of encoder errors. The drives also offer integrated soft-PLCs that can be programmed without needing separate tools.